The Cyclops Riviera lies northeast of Catania and stretches for 9 miles along the eastern coast of Sicily encompassing the fishing villages of Acicastello, Acitrezza. The area is frequented by locals and tourists who are drawn to its views out across the Ionian Sea and a small archipelago of islands including Lachea, and its pretty coastline populated by hand-painted fishing boats in small inlets that makes it an ideal spot to catch the sunset or wander along the seafront eating an ice cream, even in winter. It also attracted Italian film director Luchino Visconti, who shot his Neorealist movie "La Terra Trema" (The Earth Trembles) at Acitrezza in 1948, using local Sicilian-speaking fishermen as actors. Continuing , we will visit , Acireale . Second most populous city of the province , is known for its carnival , for the Baroque and for its thermal baths . Near Etna , it includes in its territory a number of villages with small harbor , including Santa Maria la Scala and Capo Mulini . 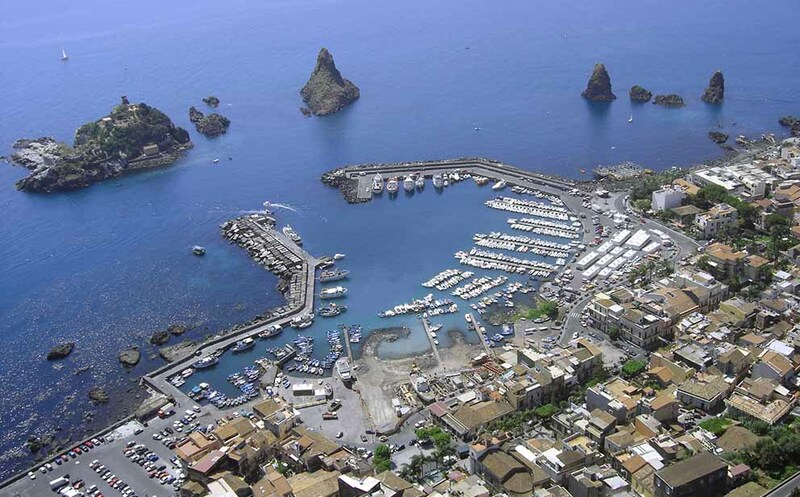 It is said that Acireale and other Aci drew its origin from Xiphonia , a mysterious Greek city now all but disappeared . The poets Virgil and Ovid made up the myth of the foundation of the love story of Aci and Galatea , killed out of jealousy by the cyclops Polyphemus . In Roman times the same territory was born a town called Akis , and that historically participated in the Punic Wars . In the Middle Ages the village consolidated around the castle of Aci and only in the fourteenth century about ten families moved further north , the birthplace Aquilia ( Aci Eagle ) or Aquilia Nuova, the first stable point of today's city . The sixteenth century was very important for New Aquilia , where consolidated a strong merchant class that brought considerable wealth to the city and settled several corporations and religious orders , leaving an indelible imprint so that even today is often referred to as "the city of a hundred bells ."